April 2011 – Total Vascular Surgery, Inc. The first step when DVT is suspected is to obtain a venous duplex study. First line of therapy is of course anticoagulation in proper individual patient. When suspecting ileofem DVT based on duplex, I would prefer immediate CT to further evaluate possible venacaval or ileofem DVT. Treatment option at this point may include thrombolysis therapy. For the past 20 years, thrombolysis therapy has been available; however, there is no solid evidence supporting this for acute DVT despite lots of successful case reports and non-official data. In my opinion, catheter based thrombolytic therapy is worth trying in venacaval or ileofem DVT patients especially if they are young or good candidates. There are several possible benefits. One is to prevent post-thrombotic syndrome which may occur in 50% of patients. Secondly it may prevent recurrent thrombosis. Thirdly it can treat or identify underlying cause such as May-Thurner syndrome which is usually left iliac vein stenosis caused by right side common iliac artery compression. Venogram can identify this defect after thrombolysis and it is best treated by stent application. 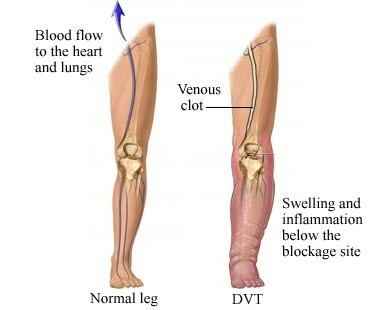 Thrombolysis therapy is time consuming procedure, however, usually taking 24 to 48 hours duration as well as requiring temporary IVC filter placement. Bleeding complication is the most common down side of this procedure. Again patient selection should be done carefully and full informations should be discussed with patients regarding detailed data of benefits and risks. © Total Vascular Surgery, Inc. All Rights Reserved.